Joe Ehrmann, a former NFL football star and volunteer coach for the Gilman high school football team, teaches his players the keys to successful defense: penetrate, pursue, punish, love. Love? A former captain of the Baltimore Colts and now an ordained minister, Ehrmann is serious about the game of football but even more serious about the purpose of life. Season of Life is his inspirational story as told by Pulitzer Prize-winning journalist Jeffrey Marx, who was a ballboy for the Colts when he first met Ehrmann. Ehrmann now devotes his life to teaching young men a whole new meaning of masculinity. He teaches the boys at Gilman the precepts of his Building Men for Others program: Being a man means emphasizing relationships and having a cause bigger than yourself. It means accepting responsibility and leading courageously. It means that empathy, integrity, and living a life of service to others are more important than points on a scoreboard. Decades after he first met Ehrmann, Jeffrey Marx renewed their friendship and watched his childhood hero putting his principles into action. While chronicling a season with the Gilman Greyhounds, Marx witnessed the most extraordinary sports program he'd ever seen, where players say "I love you" to each other and coaches profess their love for their players. Off the field Marx sat with Ehrmann and absorbed life lessons that led him to reexamine his own unresolved relationship with his father. Season of Life is a book about what it means to be a man of substance and impact. It is a moving story that will resonate with athletes, coaches, parents -- anyone struggling to make the right choices in life. 2004-06-07. New. Ships with Tracking Number! INTERNATIONAL WORLDWIDE Shipping available. Buy with confidence, excellent customer service! Simon &amp; Schuster, 2004. Hardcover. New. 8.44 x 5.5 cm. JAM Publishing. Collectible - Very Good. Collectible - Very Good. Simon & Schuster. Hardcover. 0743269748 New Condition *** Right Off the Shelf | Ships within 2 Business Days ~~~ Customer Service Is Our Top Priority! - Thank you for LOOKING :-) . New. Simon & Schuster, 2004-09-01. Hardcover. Used:Good. In Stock. Always but with confidence. 2004-06-07. Good. Ships with Tracking Number! INTERNATIONAL WORLDWIDE Shipping available. May not contain Access Codes or Supplements. May be ex-library. Shipping & Handling by region. Buy with confidence, excellent customer service! Washington, DC: Jam Publishing, 2003. Light reading crease along side of spine, else a fine, clean copy. Signed by the author to the previous owner and also signed by Jim Ehrmann by his photo on the next page. The football star is Jim Ehrmann of the Baltimore Colts. The ballboy is the author. The journey is what takes place after their reunion 25 years later. 176 pages, with frontispiece then-and-now photos of Jim Ehrmann.. SIGNED. First Edition. Soft Cover. Near Fine. Riverside, New Jersey, U.S.A.: Simon & Schuster, 2004 Signed by Joe Ehrmann. DJ has edge wear, minor creases, minor scratches, rubbed corners/spine. Boards have edge wear, rubbed corners/spine. No writing in text. Very good.. Hard Cover. Very Good/Very Good.
" The bestselling inspirational book in which the author reunites with a childhood football hero, now a minister and coach, and witnesses a revelatory demonstration of the true meaning of manhood.-Joe Ehrmann, a former NFL football star and volunteer coach for the Gilman high school football team, teaches his players the keys to successful defense: penetrate, pursue, punish, love. Love. A former captain of the Baltimore Colts and now an ordained minister, Ehrmann is serious about the game of football but even more serious about the purpose of life. 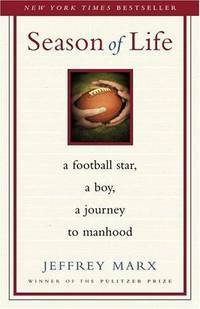 Season of Life is his inspirational story as told by Pulitzer Prize winning journalist Jeffrey Marx, who was a ballboy for the Colts when he first met Ehrmann.-Ehrmann now devotes his life to teaching young men a whole new meaning of masculinity. He teaches the boys at Gilman the precepts of his Building Men for Others program: Being a man means emphasizing relationships and having a cause bigger than yourself. It means accepting responsibility and leading courageously. It means that empathy, integrity, and living a life of service to others are more important than points on a scoreboard. Decades after he first met Ehrmann, Jeffrey Marx renewed their friendship and watched his childhood hero putting his principles into action. While chronicling a season with the Gilman Greyhounds, Marx witnessed the most extraordinary sports program he'd ever seen, where players say I love you to each other and coaches profess their love for their players. Off the field Marx sat with Ehrmann and absorbed life lessons that led him to reexamine his own unresolved relationship with his father. Season of Life is a book about what it means to be a man of substance and impact. It is a moving story that will resonate with athletes, coaches, parents anyone struggling to make the right choices in life." Simon & Schuster. Hardcover. 0743269748 Special order direct from the distributor . New. Simon & Schuster. Sports & Recreation. New. Brand New: This item is brand new unopened, never used and still in its original manufacturer condition. Washington, DC: Jam Publishing, 2003. Light reading crease along side of spine, else a fine, clean copy. Signed by the author to the previous owners. The football star is Jim Ehrmann of the Baltimore Colts. The ballboy is the author. The journey is what takes place after their reunion 25 years later. 176 pages, with frontispiece then-and-now photos of Jim Ehrmann.. SIGNED. First Edition. Soft Cover. Near Fine. Riverside, New Jersey, U.S.A.: Simon & Schuster, 2004 first edition/first printing book is tight with no markings, great copy . First Edition. Hard Cover. Fine/Fine. 8vo - over 7¾" - 9¾" tall. Simon & Schuster. Hardcover. 0743269748 . New. Simon & Schuster. Hardcover. 0743269748 Remainder mark . Fine. Simon & Schuster. Hardcover. 0743269748 BRAND NEW, GIFT QUALITY! NOT OVERSTOCKS OR MARKED UP REMAINDERS! DIRECT FROM THE PUBLISHER!|0.68 . New. New York, NY: Simon & Schuster, 2003. A nice reading copy. Pages are clean and bright. Binding is tight. Book and jacket show some shelfwear. Jacket has been mylared for protection. Jacket is scuffed and worn at the edges and corners. . Later Printing. Hard Cover. Good +/Good -. Mylared. Simon & Schuster, August 2004. Hardcover . 7.5 Bulk HB Standard. Simon & Schuster, 2004-08-24. Hardcover. Used:Good. Simon & Schuster. Hardcover. 0743269748 *BRAND NEW* Ships Same Day or Next! . New. Simon & Schuster. Hardcover. 0743269748 *LIKE NEW* Ships Same Day or Next! . Fine. Simon & Schuster. Hardcover. 0743269748 EXCELLENT TO NEAR FLAWLESS STATED FIRST EDITION, FIRST PRINTING WITH A FULL NUMBER PRINT LINE. DUST JACKET IS WHOLE WITH GOOD COLOR, NO SUN FADING OR STICKERS, NOT CLIPPED, AND MINIMAL FLAWS AND WEAR. NO NAMES OR MARKS SEEN ON TEXT PAGES. NOT EX-LIBRARY. GIFT CONDITION FIRST PRINTING. SEE PHOTOS IF AVAILABLE. 6300 SWLS16-1-2-NF22 01. . Fine. Simon and Schuster, January 2003. Trade . 4 PB Extra Nice +5%. Simon & Schuster, 2004. very good hardcover with dust jacket. 2004. Previous owner inscription. Some foxing. . Hardcover. Very Good/Very Good. New York, New York, U.S.A.: Simon & Schuster, 2004. Very good hardcover, very good dust jacket. Hard Cover. Very Good/Very Good. Riverside, New Jersey, U.S.A.: Simon & Schuster, 2004. Very Good Hardcover, Very Good Dust Jacket.. Hardcover. Very Good/Very Good. Simon & Schuster, August 2004. Hardcover . 6.5 Bulk HB Low. Simon & Schuster, 2003. Hardcover. A MINT bright copy in a gorgeous NEAR FINE dust jacket. Simon & Schuster. Hardcover. 0743269748 Autographed by author! Ships promptly from Texas. . Fine. 2004. Simon & Schuster, August 2004. Hardcover. Used - Acceptable. First book has a $3 shipping fee, there is no additional shipping fee for addition books from our store. All of our books are in clean, readable condition (unless noted otherwise). We do not accept books with water damage, strong smoke smell, or just plain beat up. Our books generally have a store sticker on the inside cover with our in store pricing. If the edges are starting to get wore, but the book is otherwise in good condition, we may have clear tape reinforcing the edges. Being used books, some of them may have writing inside the cover. If you need more details about a certain book, you can always give us a call as well 920-734-8908. Simon & Schuster, 2004. 1st Edition 1st Printing. Hardcover. Very Good/Very Good. 8vo - over 7¾ - 9¾" tall. Very Good/Very Good condition. First edition, first printing. No markings to the text block. No marks of personal identification or prior ownership. Simon & Schuster, 2004-08-24. Hardcover. Good. Simon & Schuster, 2004-09-01. Hardcover. Like New. Hardcover! (Have a name) Clean unmarked pristine pages, have some helpful marks, underline or slight tear on the jacket but overall it is in a great condition. We ship very quickly and try our best all the time. Thank you. Simon & Schuster, 2004-09-01. Hardcover. Like New. Simon & Schuster, 2004-09-01. Used - Like New. Used Like New, no missing pages, no damage to binding, may have a remainder mark. Seller: Academic Book Solutions Inc.
Simon & Schuster. Hardcover. 0743269748 . . New. 2004. Simon & Schuster. Hardcover. 0743269748 Ships from Tennessee, usually the same or next day. . New. 2004. Simon & Schuster. Hardcover. 0743269748 Ships promptly from Texas. . New. 2004. Simon & Schuster. Used - Very Good. Former Library book. Great condition for a used book! Minimal wear. Simon & Schuster. Used - Very Good. Ships from Reno, NV. Great condition for a used book! Minimal wear. 100% Money Back Guarantee. Shipped to over one million happy customers. Your purchase benefits world literacy! Simon and Schuster. Used - Very Good. Former Library book. Great condition for a used book! Minimal wear.